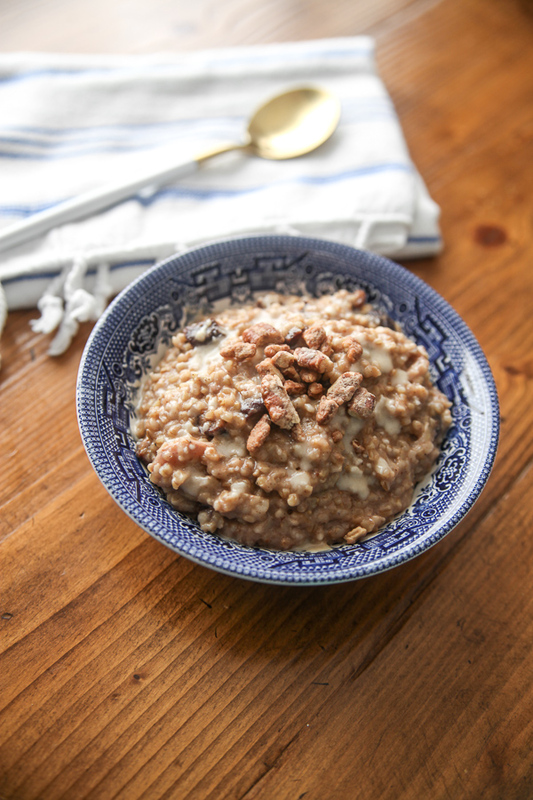 I thought a warming bowl of oats would be perfect as a heart healthy recipe for Valentine’s Day! 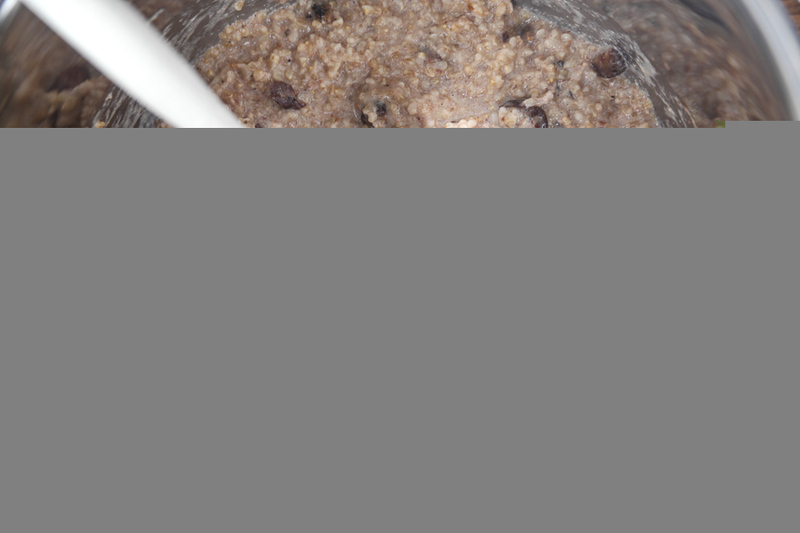 Studies show 3 grams or more of soluble fiber daily from oat bran (part of the whole oat! ), as part of a diet low in saturated fat and cholesterol, may reduce the risk of heart disease. 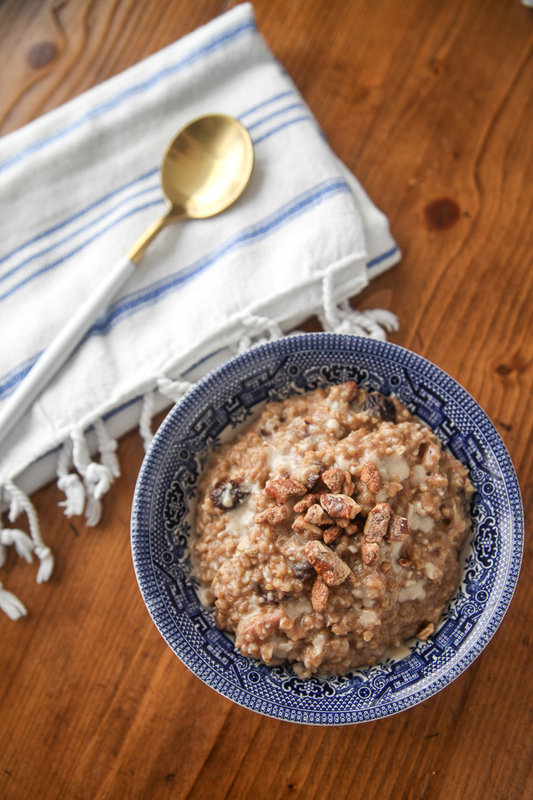 Let’s all dive into oatmeal today to keep our hearts beating strong. 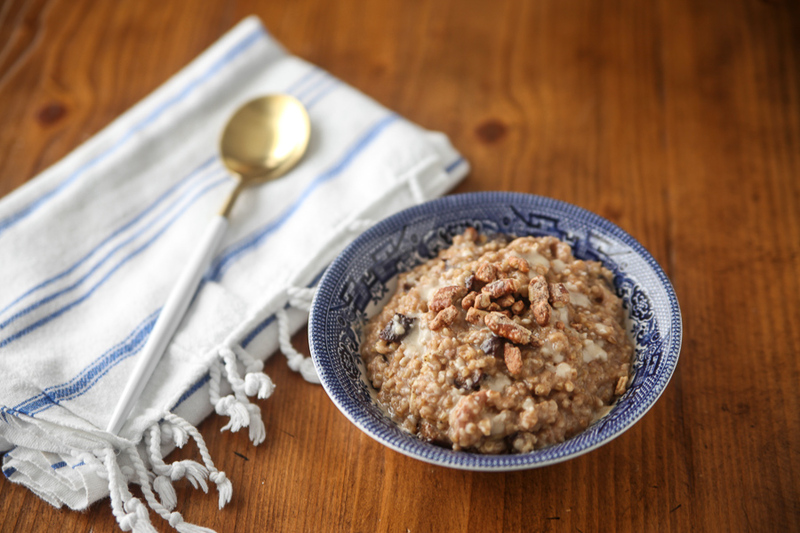 Both rolled oats and steel cut oats are nutritionally comparable and have the same heart healthy benefits. Read more about that in my Seed To Spoon tour with Quaker. 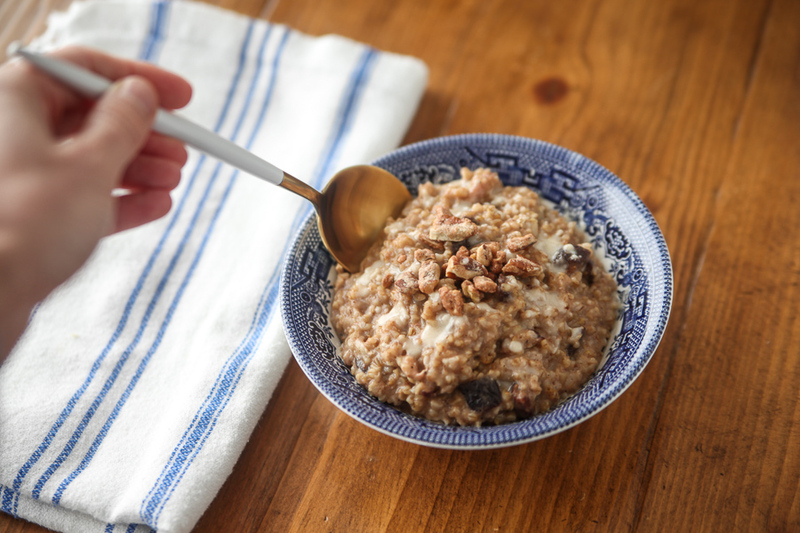 I like to make rolled oats on the stovetop because they’re so quick to heat up, but steel cut requires a longer cooking process – and one that must be watched (because they can bubble over) and stirred (because they can stick to the bottom). I studied some recipes online to get the technique right. The biggest concern other people had was sticking to the pot, but with a 4 minute cook time and 15 minute natural release, they turned out great – no sticking! I veered off the path of plain in favor of a unique flavor and went with chai spiced with dried fig. My kitchen was filled with the smell of warm spice! Since I didn’t have a chai mix, I put a quick mix together with the common spices I always have in my pantry. It might not be 100% authentic chai, but it was close enough. This makes about 8 servings, so mix all spices together in a jar and store the rest for later. I used 2% milk and banana in the mix too. Whenever I make steel cut oats in the rice cooker, I always program it to come on automatically in the morning so I can’t add milk because it would be out of the fridge too long overnight. So the same-day Instant Pot technique means I can use all the fresh ingredients I want. I dressed up the finished bowl with a drizzle of melted coconut butter and spiced pecans. So good!! The rest of the servings went in the fridge to be reheated on other days – I even had some for a snack! This hands-off recipe will fill your kitchen with the smell of chai. 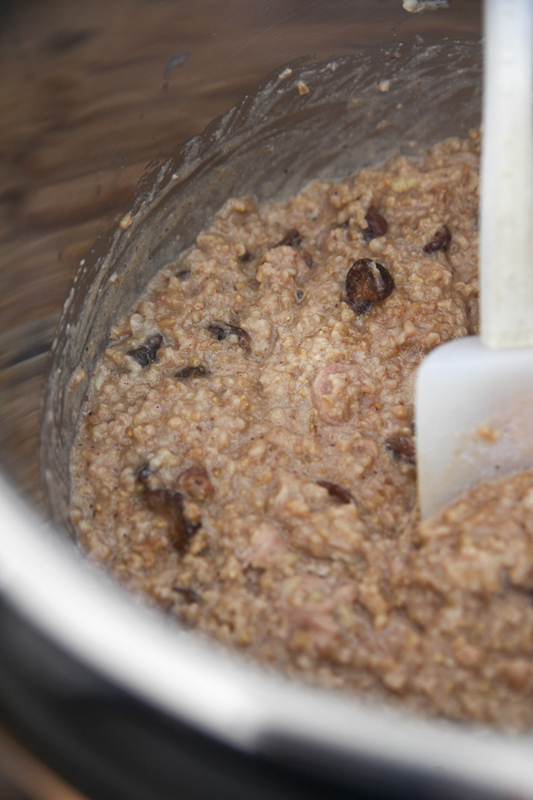 The oatmeal is naturally sweetened with bananas and figs, and milk provides a creamy base. Put Instant Pot on sautee mode to heat bottom and melt butter or coconut oil. Add oats, milk, water, spices, figs and banana. Close vent and set to Pressure Cook for 4 minutes. Once cooking is done, wait 15 minutes for a natural release until the clock reads L15:oo and open the vent. Yum!! These look so good (texture wise especially) and I love the fig addition! I am the proud new owner of an 8 quart Instant Pot since my crock pot bit the bullet last week. 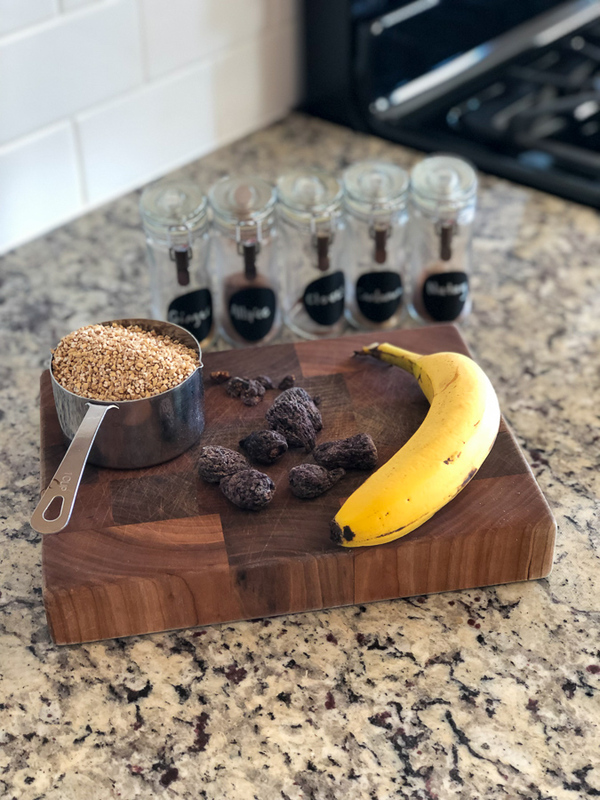 This will probably be the first thing I try as I love making steel cut oats and having them in the fridge to reheat. These look delicious! Do you know how long it took for your Instant Pot to pressurize and start the 4 minutes? I always have a hard time judging how long Instant Pot recipes will actually take to time it right…. It wasn’t that long – maybe 8 minutes? Have you ever tried quinoa flakes? I was getting tired of oatmeal and randomly tried these- they’re literally just pressed quinoa. And practically instant! Add hot water, let sit a few min and that’s it. I am eating this right now, and it is absolutely amazing! The cardamom really makes it special. Did you have any issues with your milk burning? 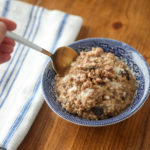 Other instant pot oatmeal recipes I’ve seen recommended using non-dairy milk because regular milk would scorch. But I love making my steel cut oats with 2% milk for added protein and fat and haven’t been brave enough to try them in the instant pot yet! No issue! I didn’t even think of that. I’ve never had trouble on the stove either. Maybe because I usually do half water?